The Secret Recipe Club is a monthly challenge that I really love participating in! I have been taking part since August 2011 and each month I am get to meet a new blogger! This month I got to visit with SteakNPotatoesKindaGurl – Desi is a psych major (I am too) and has just listed her 30×30 – 30 recipes she wants to make before she turns 30. I was hoping that one of these would have been done my the time I made my choice, but she has not yet started tackling her wishes. So instead, after much looking, I chose to make her Parmesan Meatballs With Fettuccine And Alfredo Sauce as I love pasta! Desi has adapted most of her recipes, showcasing other bloggers and I hope my showcase of her adaptation is just as good. I am submitting this recipe to Presto Pasta Nights, which is being hosted this week by Ruth, the founder! Looks yummy! By the way I love the name of your blog. What a very cool take on the old standard spaghetti and meatballs. Thanks for sharing with Presto Pasta Nights. Mustard in the Alfredo sauce is new and interesting. Thanks Tandy. Meatballs, parmesan, pasta, cheese..food heaven! 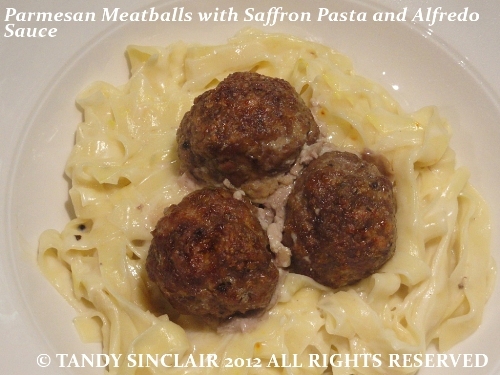 Tandy, the meatballs with Parmesan cheese in it sounds delicious…nice paired with the saffron pasta. What do I love more? The meatball or the alfredo? My niece is here for the summer and she was just asking me this weekend if we could make meatballs and pasta. I think this is a sign we need to get on that, this looks fantastic! I love meatball and these sound awesome with the parmesan! Love the whole meal! Holy Moly! That looks so tasty! This meal looks absolutely delicious! Great SRC pick!